MLK weekend is always a competitive weekend for distance races all across the country. 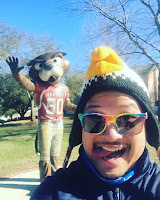 In 2015, I headed to Phoenix to run the Rock 'n' Roll Arizona Half, and continued a fun weekend of exploring Scottsdale, the Prescott Valley, Jerome, and Sedona. 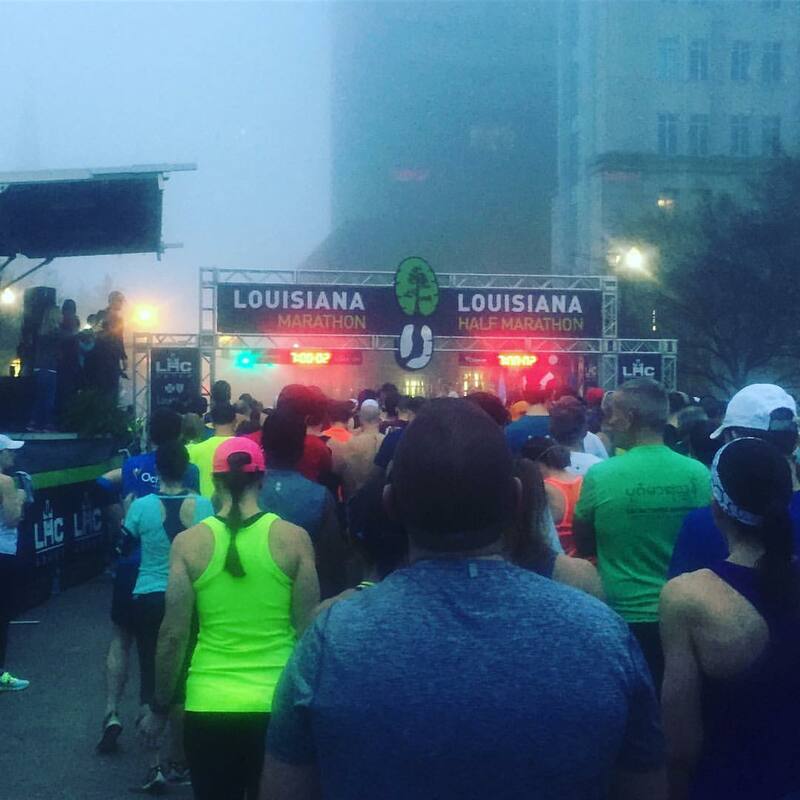 For 2016, I decided to run the Louisiana Marathon in Baton Rouge, highly touted as a well-organized race with an incredible post race food spread. And lucky for me, I also was able to get the national anthem gig for this race! Because of the three day weekend, I opted to fly out first thing Saturday morning rather than my usual after work on Friday travel. To get to Baton Rouge, I flew through Atlanta, and had a lengthy layover there - so I got to use the Club at ATL in Terminal E, thanks to my Chase Sapphire Rewards benefit of Priority Pass Select for airport lounges all around the world, including this one. After a delicious breakfast, I headed to my gate and was pleasantly surprised by an upgrade to first class! 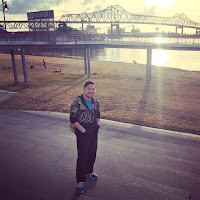 Upon arrival, I grabbed my car and headed directly to expo at the Baton Rouge River Center, where I picked up my bib and met with my contacts for the race to introduce myself, and then met up with Lynne, who had arrived a day earlier. We took advantage of the beautiful afternoon and took some photos along the Mississippi River boardwalk, with the Horace Wilkinson Bridge and the USS Kidd in the background. I then drove over to the Airbnb I had booked in the MidCity neighborhood of Baton Rouge to check in. The accommodations were great - I stayed at a beautiful 100-year-old craftsman home with 14 foot ceilings and great architectural details. The owners remodeled the house recently to accentuate its classic charm but fit it in with their modern style. 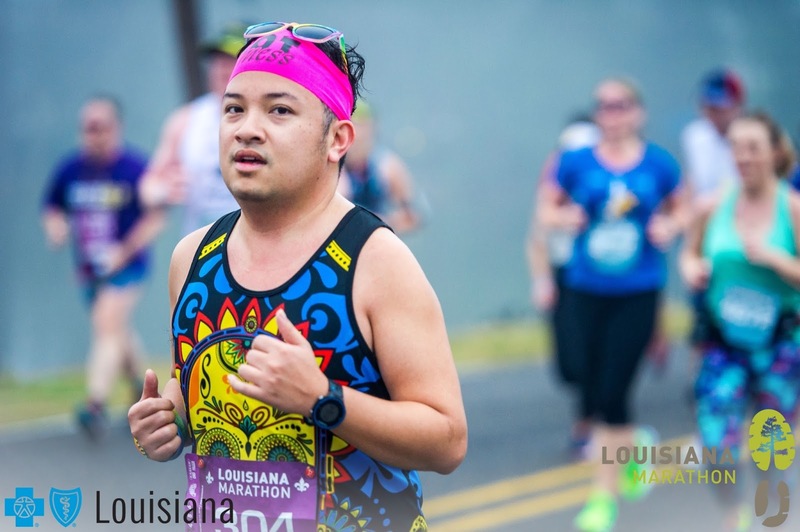 It was a quick drop off of things before heading right back to the River Center, as not only was the expo for the Louisiana Marathon happening, but a huge cheer competition was also going on. My cousin Chrissy and her daughter Lily were in town from nearby New Orleans to partake in the competition, as Lily competes with a pretty high-level cheer and stunt team. 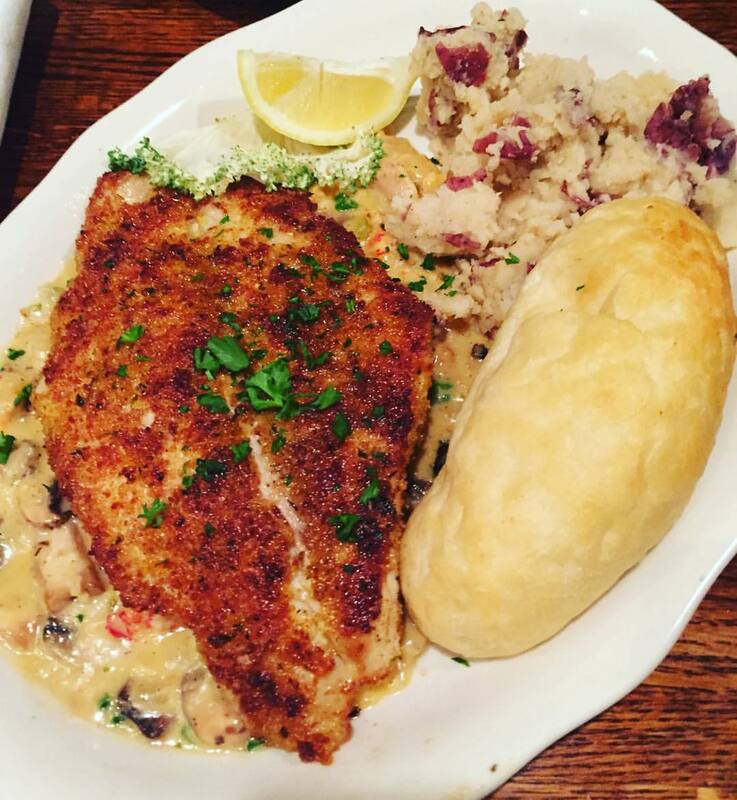 After they had finished with the day, we headed to dinner at Baton Rouge's famous Parrain's Seafood restaurant. We didn't wait too long for seating on this busy Saturday night, but it was enough for me to encounter Louisiana's legendary massive mosquitoes buzzing around while waiting. For dinner, I was well fed; I shared some charbroiled oysters with Chrissy, and then had an incredible andouille encrusted fresh fish all to myself. 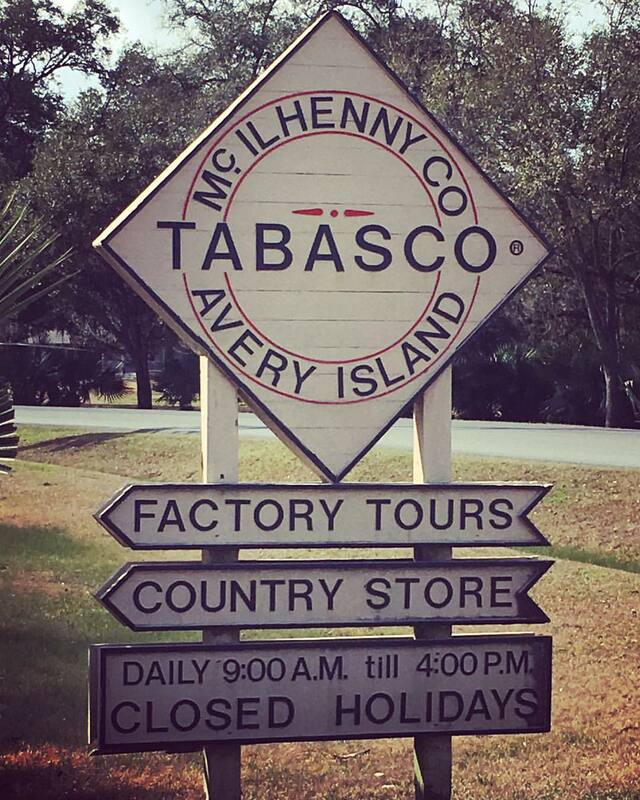 An amazing mill that I can still remember today... Mmmm. After filling up properly to carbo-load, we returned back downtown, and then I called it an early night, retreating back to the Airbnb since I had an early morning ahead of me. 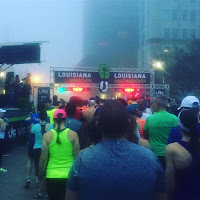 The following morning, I woke up at 5:30, packed everything up, and left through thick fog to head to the VIP Parking Garage located steps away from the start area in front of the Louisiana State Capitol. I mulled around for a bit before getting to the start area around 6:30 for the national anthem. 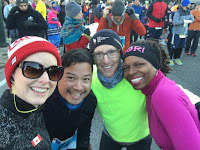 To an assembling crowd of over 3200 runners, I sang the Star Spangled Banner, before embarking on my own 26.2, alongside Lynne and her roommate for Friday night Sharon. Through thick fog (61º and 100% humidity! 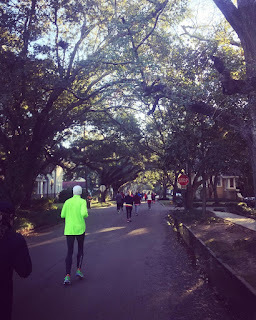 ), we headed south on 4th Street, turning left onto the treelined North Boulevard, passing the Louisiana's Old Governor's Mansion, and then our first hill - a ramp up and over 13th through 18th Streets, which we would later see again at the mile 25 mark. 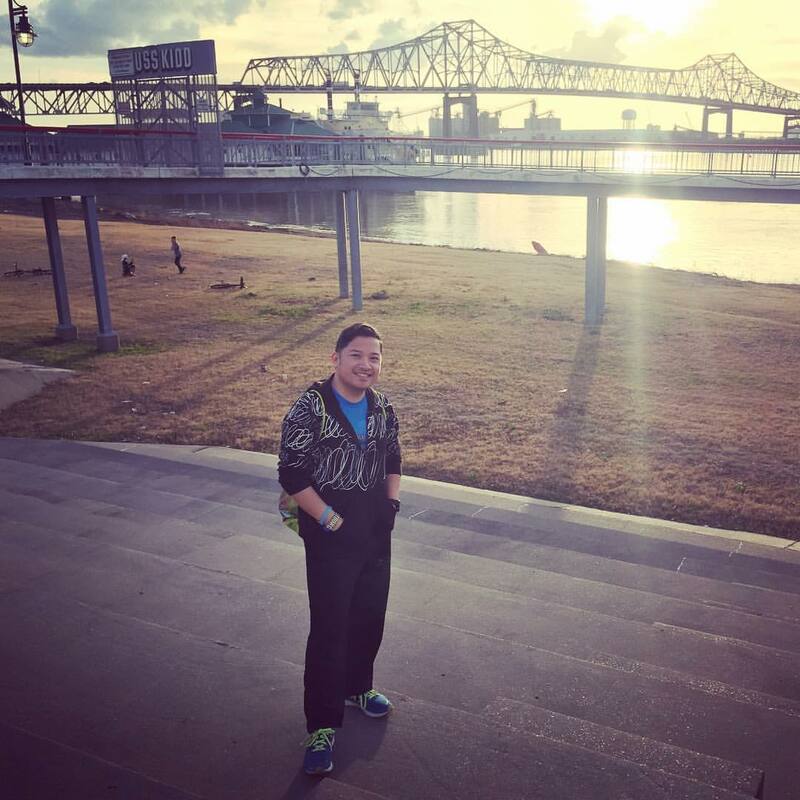 I had my headphones in for that first mile, and realized that I really didn't need them like I thought I would - so I stuffed them in my pocket and let myself listen to the sounds of fellow runners and of cheers from Baton Rougians. 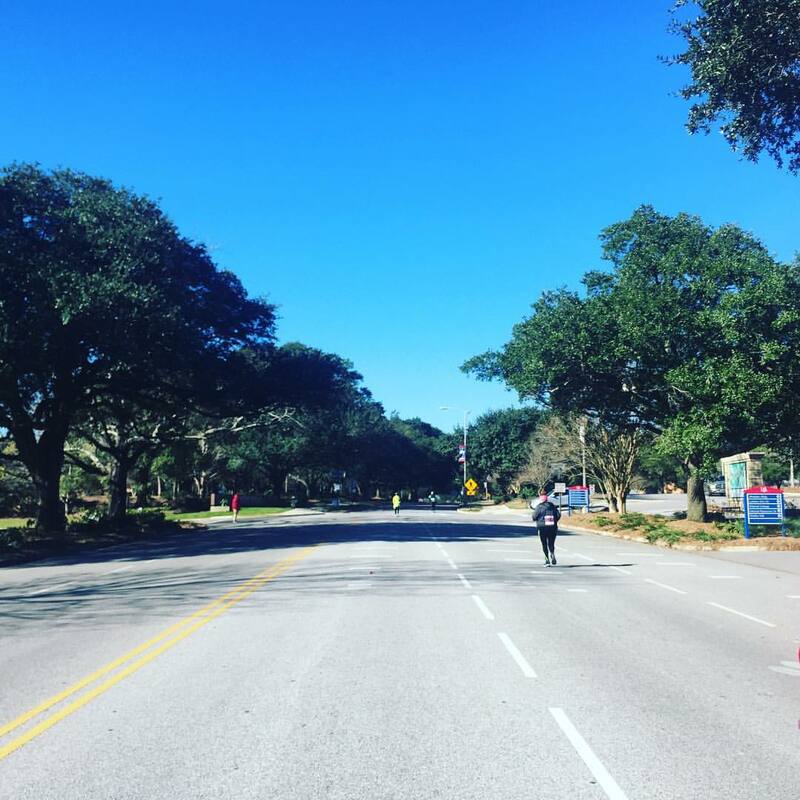 From there, we turned right onto Park Blvd (stopping to have a mimosa along the way!) as we headed due south into LSU's campus, eventually putting ourselves on Dalrymple Drive, the main entryway into the campus. Running uphill on the first mile. D'oh. 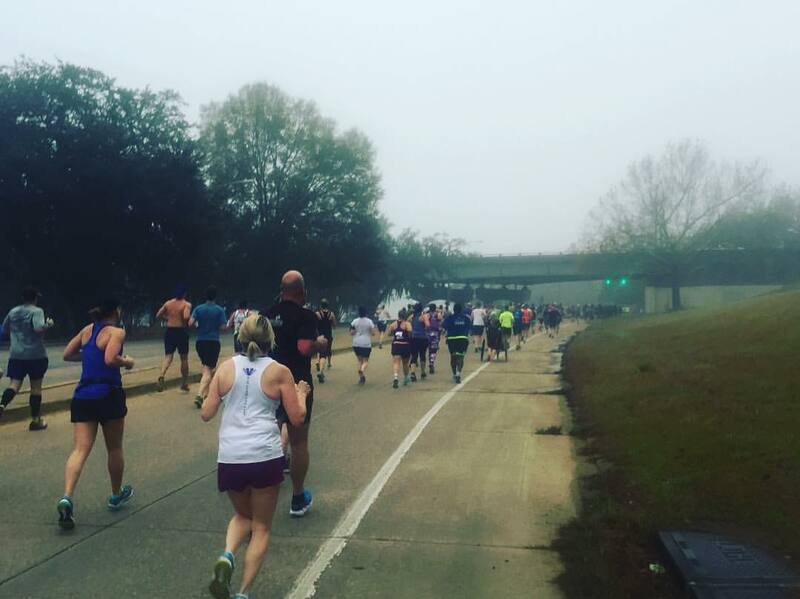 By then, the fog had begun to dissipate, while the temps still stayed high enough to cause us all to break a sweat. 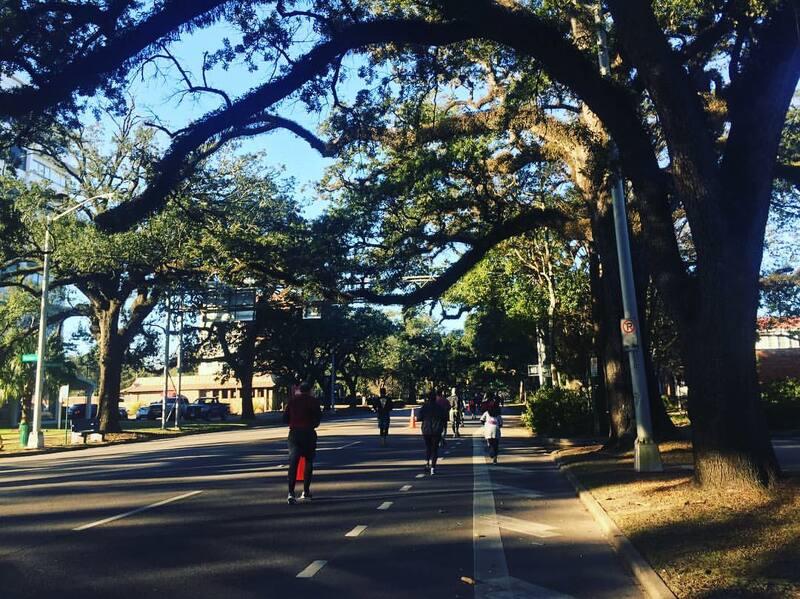 One of the highlights of running through the college campus was running past LSU's famous Tigers Stadium and at the same time grabbing a whole donut, walking while devouring it, and then continuing on running through campus. We then followed some residential streets named after other prominent colleges (Cornell, Harvard, Oxford, Yale, for example) before heading northward on Stanford Avenue alongside Milford Wampold Memorial Park, a park that juts out into University Lake. We then turned onto Lakeshore Drive, where we would follow right along the edge of the lake and near some awesomely gigantic lakefront mansions. 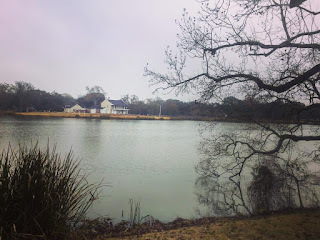 This lake actually looked oddly familiar to me, and it wouldn't be until later that I realized that this was where scenes from the movie Pitch Perfect were filmed. 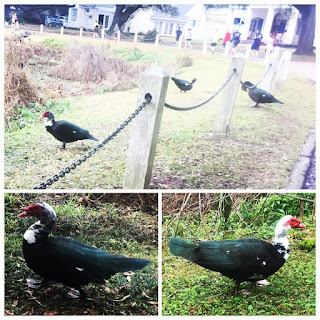 Along the way, I saw some very interesting looking ducks lounging by the lake - seemingly perfect looking for being in Louisiana, like they were wearing Mardi Gras masks. 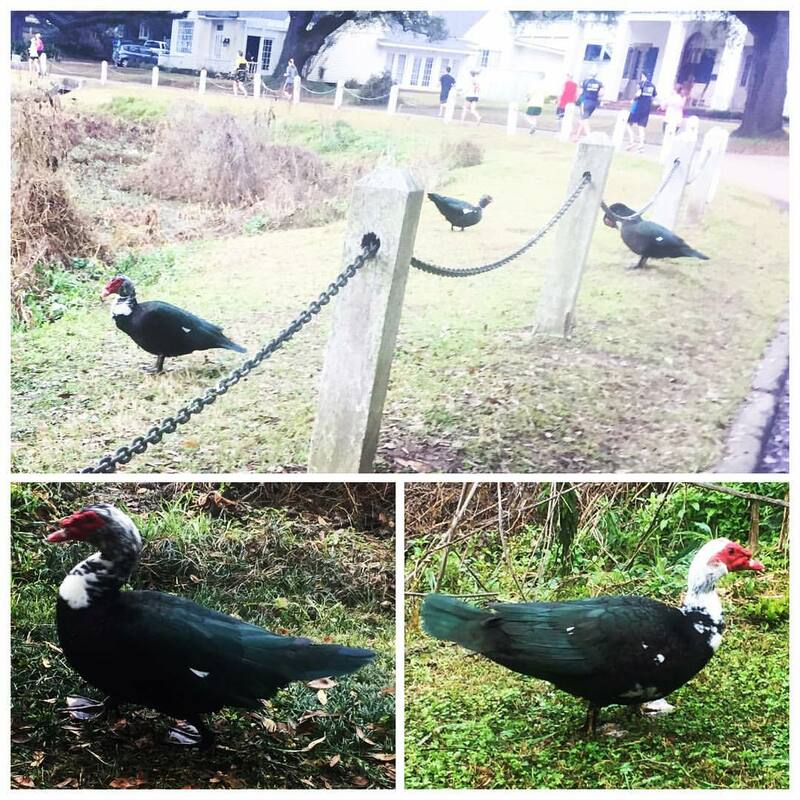 It was later that I found out these were called Muscovy ducks, considered an invasive species, but plentiful to the southern United States! Scenes from Pitch Perfect, perhaps? 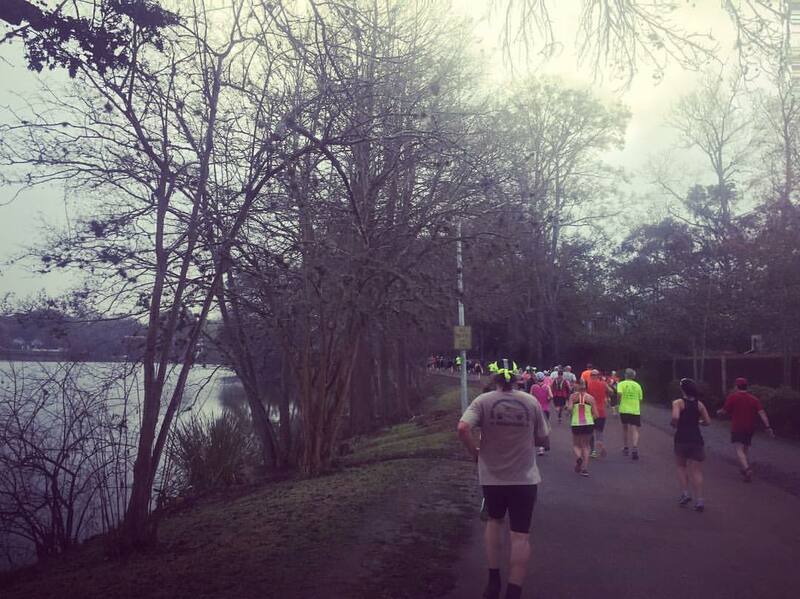 We followed the perimeter of the both University Lake and City Park Lake all along Lakeshore Drive, which was roughly three miles of road, from mile 7 to mile 10. I ran some pretty even splits, roughly 10:30 for each mile. We finally met right back up with Dalrymple Drive and past the City Park Golf Course, before eventually turning onto Kleinert Avenue, and splitting off from the half marathoners, as they kept going straight, returning back to the finish line with 3 miles left to go. 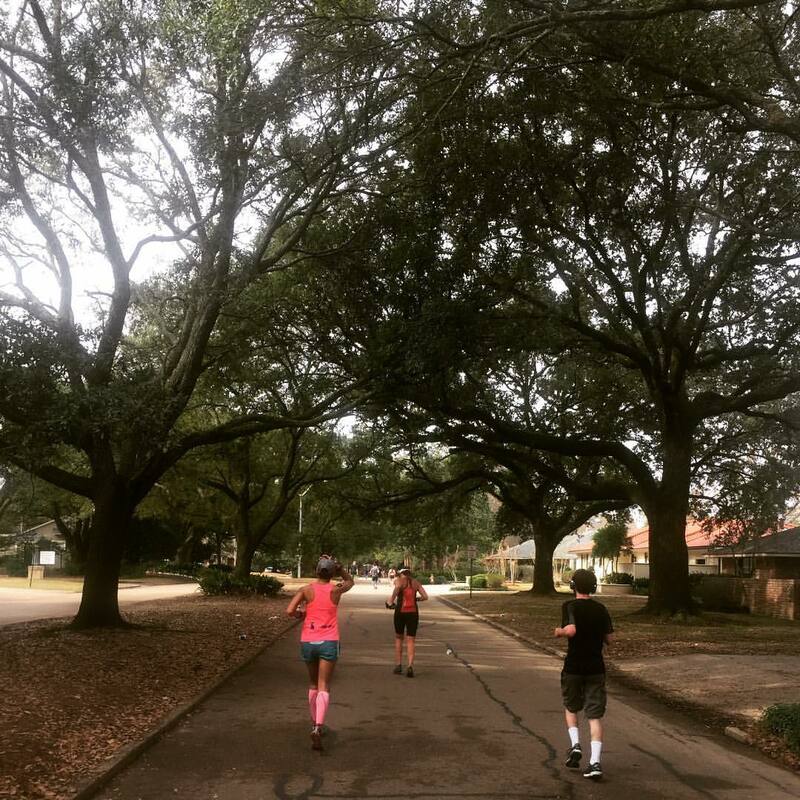 However, we lucky marathoners were treated to a magnificent canopy of oak trees along Kleinert Avenue, taking us further east, as we ran deeper into Baton Rouge's historic Garden District. 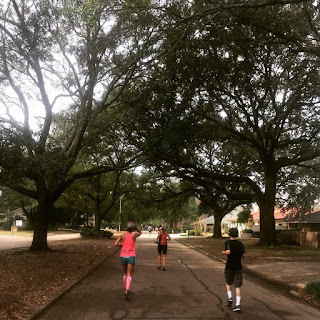 After 3/4 of a mile, we turned up along Parker Street toward Catholic High School and Claycut Road, then doing a 3+ mile section through heavily residential areas in the expansive Mid City neighborhood just east of the Garden District. I timed my first GU well, taking my first at the 14 mile mark. We emerged back onto Claycut Road, and encountered runners heading back on the same stretch toward the finish line - for me, my 15.5 mile mark was the 22 mile mark for those much faster runners. 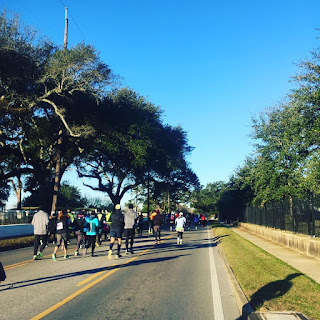 This whole stretch of the race consisted of lots of running thru residential neighborhoods, but nevertheless, it was still very well supported. I even had an opportunity to play flip cup at an "unofficial" beer aid station around mile 17 on Sevenoaks Avenue with some LSU students. Around half a mile later, Sabrina, the 4:40 pacer (along with my friend Ken) caught up and passed me, and I realized I was actually making some decent time. Mile 18 passed, and I took another GU. At around the point where we had turned around to head back toward the river (around the 19 mile mark) it started to get really hot. We progressed westward, then took Chevelle Drive northward up to Goodwood Blvd/Goodwood Ave, which returned to Claycut Road. 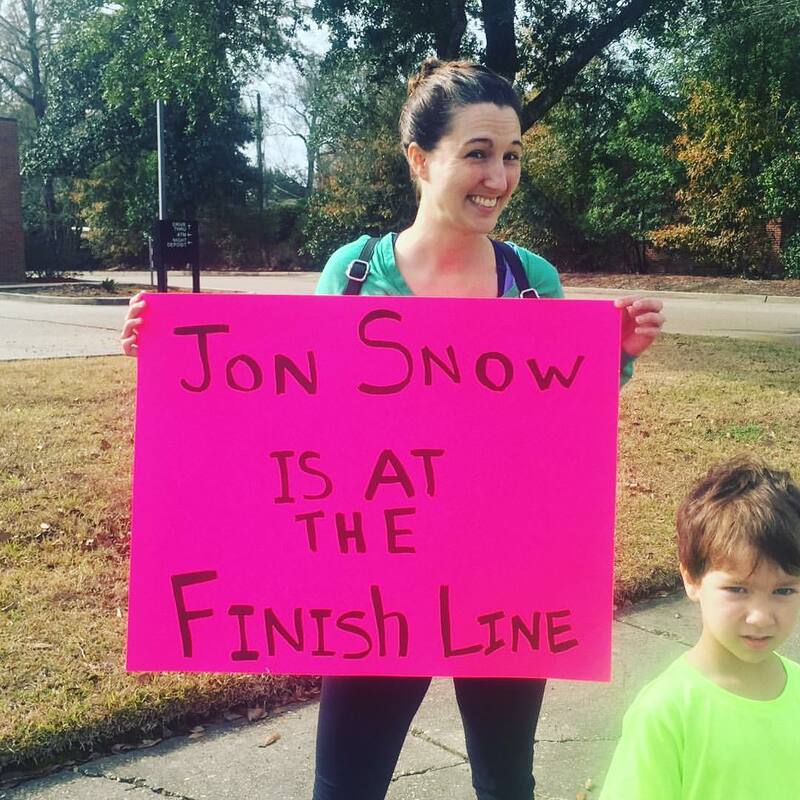 I stopped for a quick bathroom break at mile 20, not long after seeing an awesome Game of Thrones themed race sign that kept me going. As I approached mile 22, I found my friends Larry and Dee Dee heading out. At this point, I took my last GU, and girded my loins for the last four miles. Despite my tiredness, I stayed consistent with my 4 minute run, 1 minute walk interval unless there were big hills... and really, the only time that big hill came was at mile 25, back on the North Boulevard ramp we had run near the beginning of the race. I enjoyed the downhill, but the course seemed to go on and on until we finally made the turn right toward the finish. 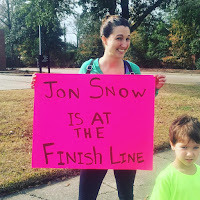 And then, of course, the actual finish line was still another eight or so blocks away. 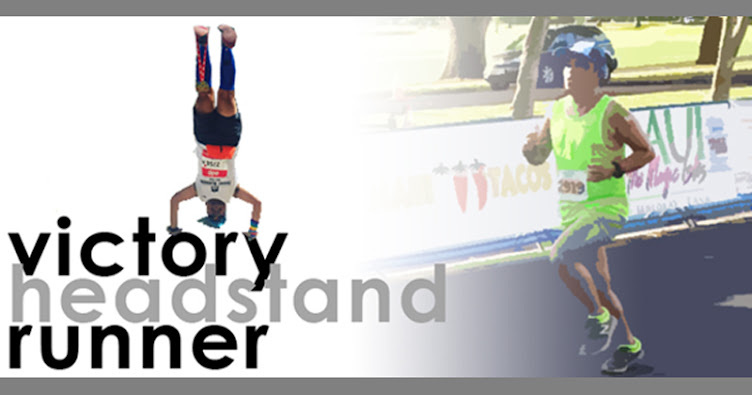 I crossed the finish mat in 4:52:59, only about three minutes behind Lynne, and happy to have another sub-5 in my name. I headed to the VIP area post race, and scarfed down some incredibly delicious red beans and rice and jambalaya, while cooling down over an Abita. But you think that that amazing food was only reserved for VIP? Think again. ALL finishers got a chance to have six servings from any of the amazing food trucks and beer trucks that scattered the Food Village located at the Finish Fest. 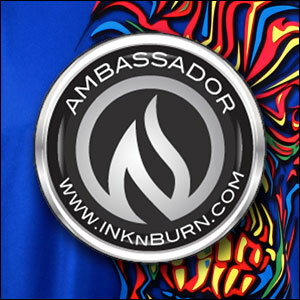 Runners have their wristband to accumulate these attached to their bibs, and the public can purchase these wristbands either at the expo or at the festival itself. We were also treated to some musical stylings from local performers and local bands. It's quite the amazing party atmosphere. After a little while, I headed out back to the finish and waited for Larry and Dee Dee to come in - they were delighted to see me yet again. I got back in touch with Lynne and showered at the Holiday Inn where I would stay on Saturday night with her. Later that afternoon, we drove over to see my old high school friend Kinsey who had moved to Baton Rouge only a few years earlier. She works as a live-in caregiver for an elderly couple, and it was nice to have some iced tea while catching up. Lynne and I then headed to dinner on our own at a restaurant recommended by locals called The Chimes near LSU's campus. We noshed over some delicious Boudin balls (pork and rice sausage, removed from its casing, and formed into breaded and deep-fried balls), Crawfish Étouffée (a Louisiana favorite), and a local brew - a Gnarly Barley Korova Milk Porter. After a fantastic day of running 26.2 miles and eating to our hearts content, we slept well that night. 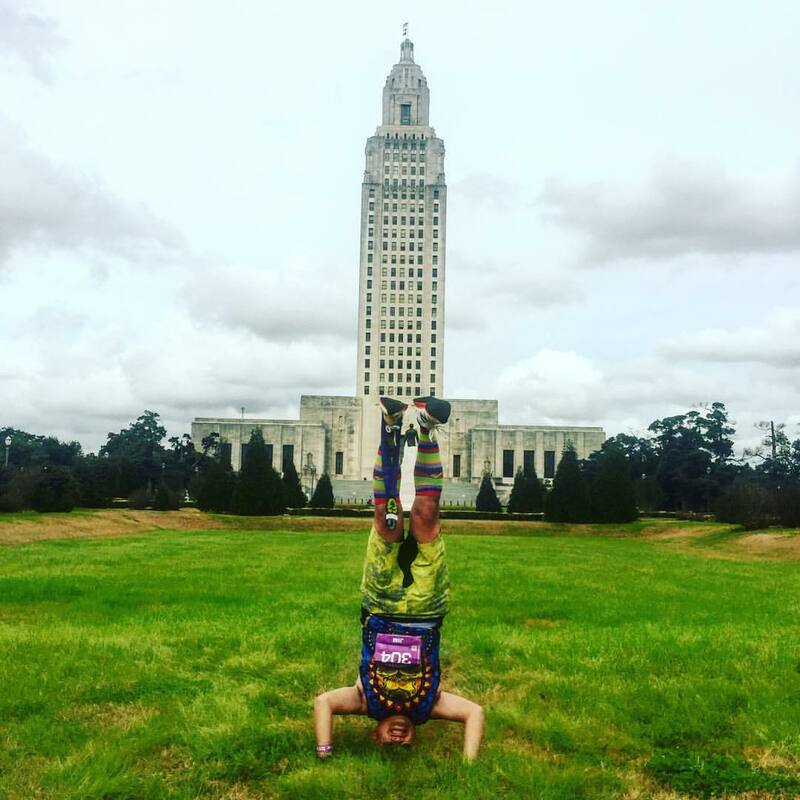 But it was a holiday weekend, so we had all day Monday to take in more of Louisiana! 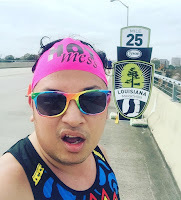 We slept in a little bit (til 7:30am) and took advantage of hotel breakfast with other runners, then got on the road around 9:30, driving about an hour southwest to Louisiana's fourth largest city, Lafayette, considered the crossroads of Cajun and Creole culture in the US. 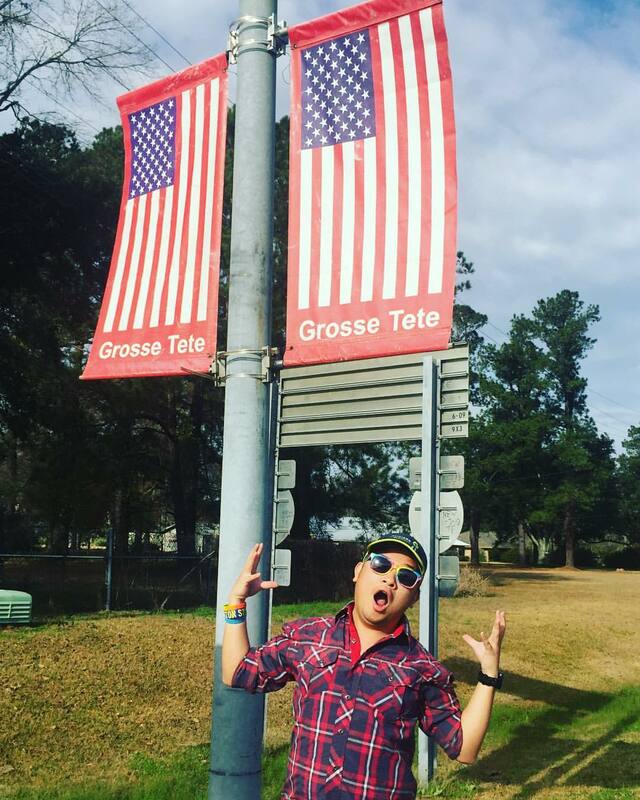 On the way, I made us stop for picture in the little village of Grosse Tête, mainly because the name translates from French into "big head." In Lafayette, we hit up Borden's Ice Cream, the last remaining Borden's retail ice cream parlor of its kind in the country. Built in 1940, the historic parlor is considered a Lafayette institution, and is famous for its Gold Brick Sundae - Borden's golden vanilla ice cream, with Elmer's gold brick topping (milk chocolate sauce with bits of pecan), whipped cream, and a cherry - the "old fashioned way." 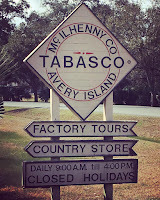 After savoring the delicious treat, we headed down I-90 toward Avery Island, the island where Tabasco peppers are harvested and the sauce is made by the McIlhenny Company. 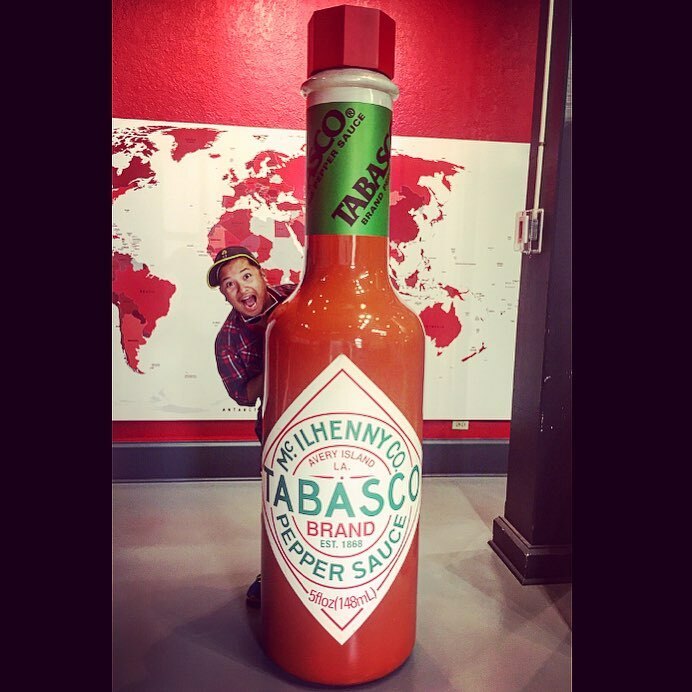 On the island is the Tabasco Museum, where people can tour the factory, learn about how the sauce is made, how it's been marketed worldwide over the years, and even observe the bottling operation. At the end of the self-guided tour, visitors are free to sample different types of tabasco flavors (mustards, jellies, salsas, and of course sauces), as well as tabasco soda (!! 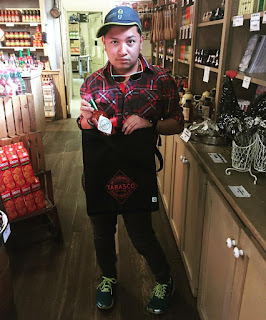 ), raspberry chipotle and jalapeño flavored ice cream, in the Country Store. 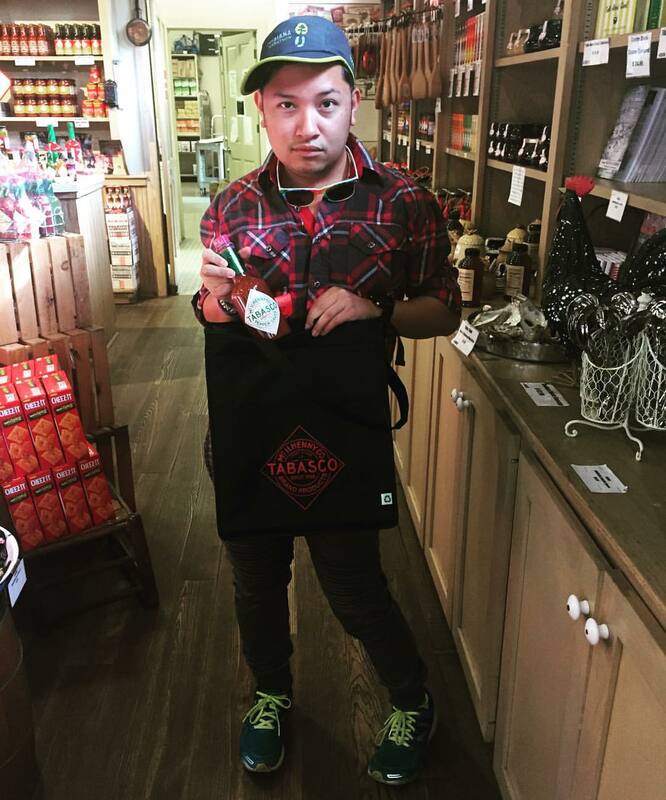 I got hot sauce in my bag... SWAG. 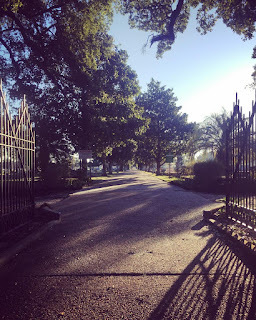 With a bit of time left, we decided to make a full loop of the South Central Louisiana and drove 40 minutes down to Franklin, to see its quaint Main Street which is on National Register of Historic Places. We continued down I-90 to Morgan City, which lies on the eastern shore of the Atchafalaya River, but also ended up getting caught in a massive rainstorm, with rain that came down so hard it obscured our line of sight on the highway. Thankfully, it was not long lasting, and dissipated. Upon reaching Morgan City, we had planned to do a rig tour, but another impeding raincloud and timing would delay it, so we opted for photos instead, and then stopped along the Atchafalaya River waterfront for photos, before heading back to Baton Rouge, making a quick stop on our way northward to the Nottoway Plantation, a Greek Revival and Italianate-styled mansion, considered the largest extant antebellum plantation in the house, with 53,000 square feet of floor space. 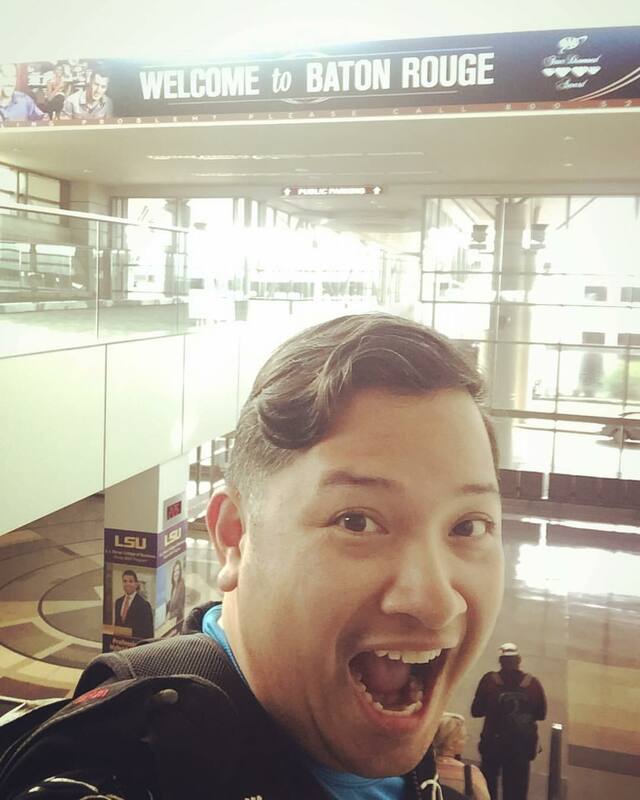 With time running out, we got ourselves back to Baton Rouge by 3:45pm with enough time to spare to make our flights - Lynne to San Francisco via Houston, and me back to NYC via Atlanta. Added bonus - another upgrade to first class, and right alongside fellow runner Lisa, who was headed back to south Florida. I accomplished quite a bit in my three days in Louisiana, and had another marathon in the books, another new airport visited, and a lot of memories to look back to! We last left off with my final race of 2016, ending the year with a ton of amazing accomplishments. Not only did I run 22 half marathons and 20 full marathons, I was able to finish my 50th state for half marathons in July in Missoula, Montana (where I got to celebrate with over 30 amazing running friends!) and then later that month, run an ultramarathon - the San Francisco Marathon from the finish line to the start and back to the finish! 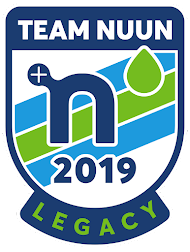 The second half of the year was also bursting several international races - half marathons in Ireland, Canada, and Denmark, and full marathons in Germany, Portugal, and Italy! And, I got my national anthems challenge started, singing all over the country, and racking up states nicely! Singing the "Star Spangled Banner" all over the country! 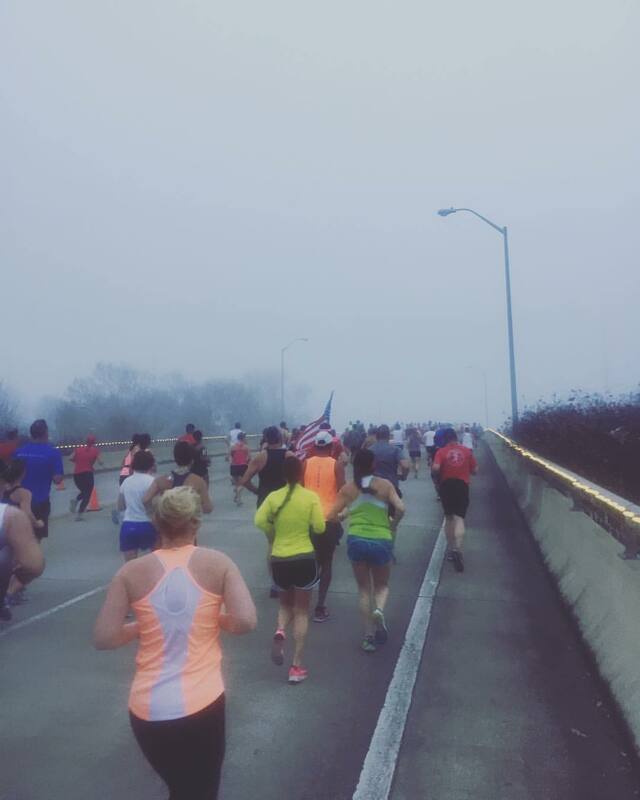 I took a nice long four week break after the Jeff Galloway 13.1, keeping my calendar free of races through the rest of December, returning back to the roads during the first full weekend of January. 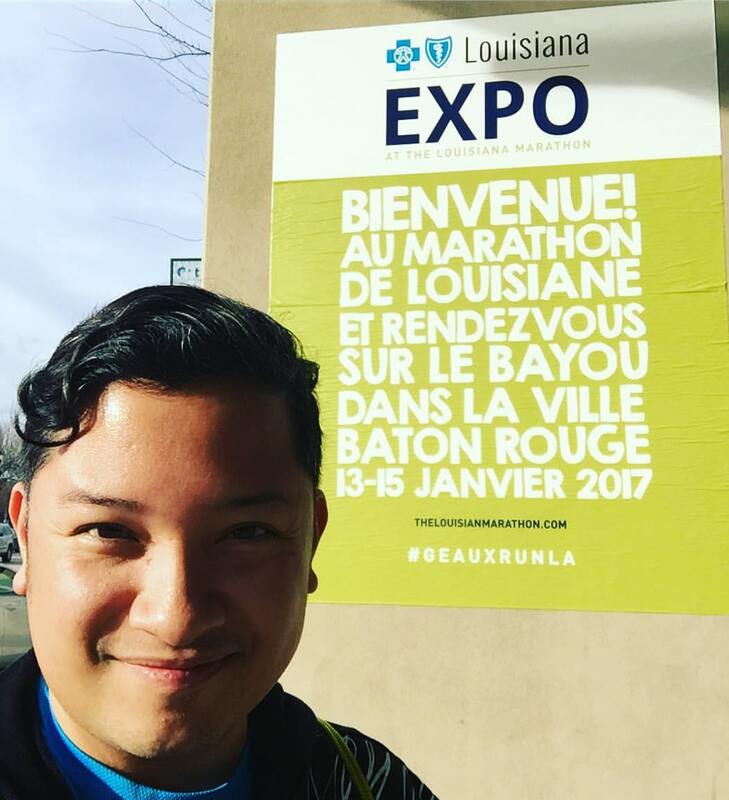 I was going to start off 2017 strong, with a double marathon weekend. 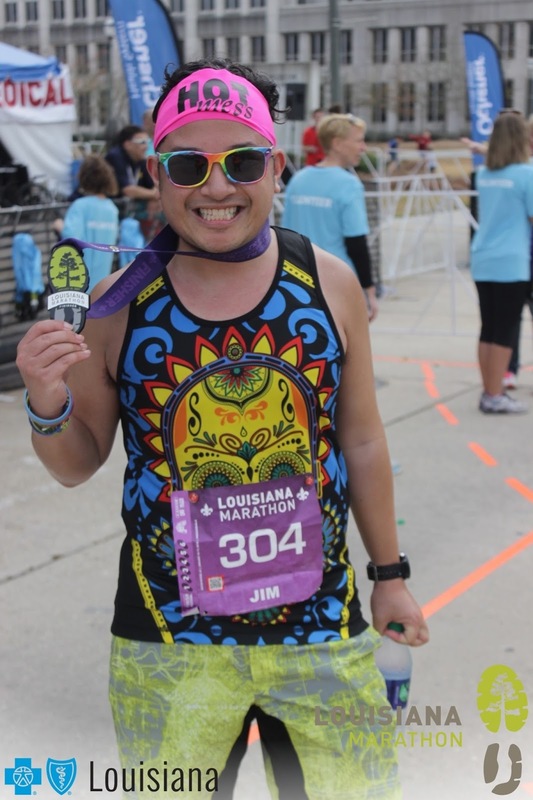 I would be heading back down south, revisiting two races I did almost exactly two years ago, when I ran double half marathons at the Mississippi Blues Half in Jackson, Mississippi, and the First Light Half in Mobile, Alabama. 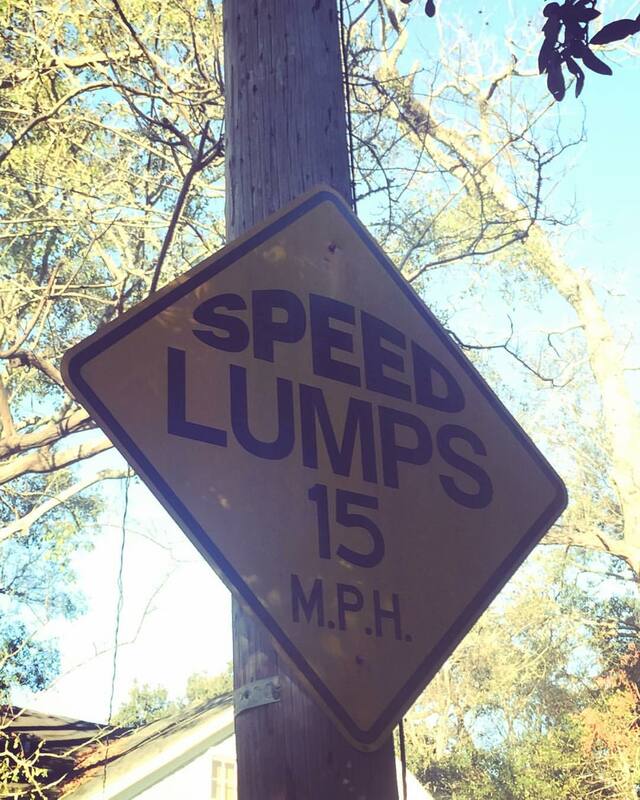 But this time they would be fulls! January was off to an interesting start weatherwise, nationally. A weather system in the west coast came ashore in the early part of the week, impacting the Northwest and Southwest with significant snowfall totals, then went on to strike the Southeast , morphing into a nor'easter. Dubbed "Winter Storm Helena" by the Weather Channel, it brought unprecedented 30 degree temperatures and an ice storm to the unready states of Alabama, Mississippi and Georgia. All day my flights had been listed as being on time, despite cancellations already starting to build up. 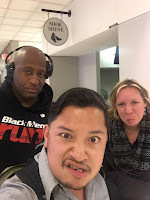 In fact, United cancelled all flights out of Newark heading down to Atlanta, where I was headed to connect to my flight to Jackson. I arrived at JFK and made it to my gate just as the flight was about to board, and we were still good to go to head to Atlanta. Uniquely, we were flying down in a massive 777-200LR, being repositioned for an international flight out of Atlanta that night. Apparently, it had arrived from Tel Aviv that morning. It was an uneventful flight, however I decided to get WiFi messaging so I could keep up with others on Facebook Messenger to see if my flights would end up being cancelled, as Atlanta was seemingly beginning to shut down. While I was in the air, my connecting flight to Jackson did get cancelled, as Jackson Airport was shut down because of the icy weather there. We landed around 8:30, but ended up sitting on the tarmac for another 40 minutes because of a plane in our gate. Apparently, planes readying to take off were needing to be deiced, and it led to a jam up of planes having to stay at their gates before being able to line up for the deicer. 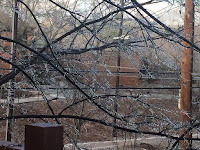 Steady rain was falling at the Atlanta airport, turning into freezing rain in the frigid winter air. When we finally deplaned, the Atlanta Airport was eerily quiet. I have never been to this airport and seen so few people wandering about. Since my flight was cancelled, I put out a plea on social media to try to find accommodations for the evening (as it turns out, several of my Atlanta-based friends had either gone out of town that weekend, too, or were in living situations that weren't amenable for last-minute guests). Meanwhile, I headed from Terminal E to Terminal A, so I could see Black Sheep friends De Moe and Laura before they headed back to Baltimore (they were to be on the same Jackson flight as I, and decided to just head back to where they had come from... ultimately, with the deicing lines, their plane heading back to Baltimore ended up on the tarmac waiting to take off for another TWO hours). 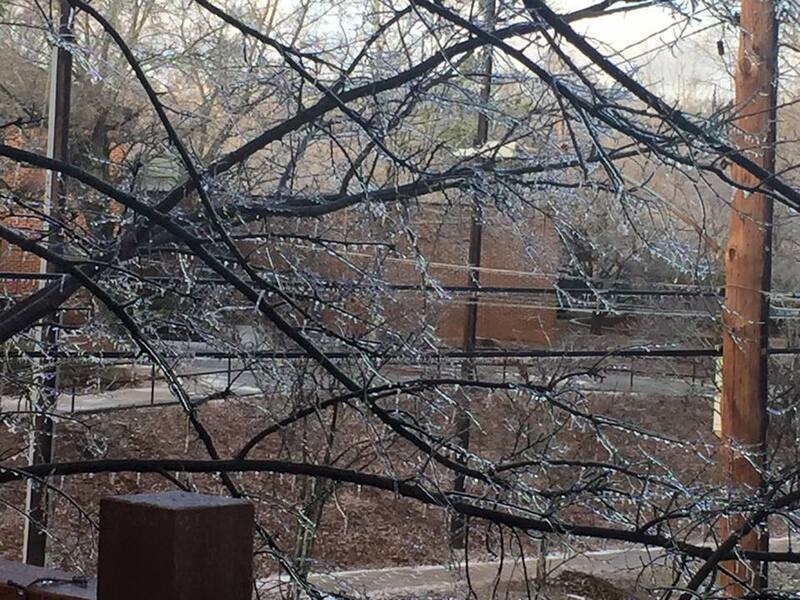 Ice covering tree branches in Atlanta! 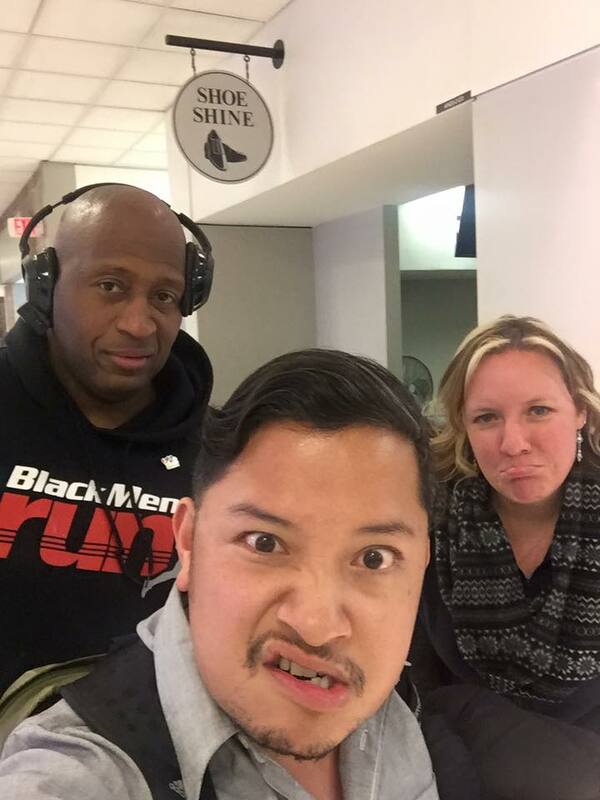 I grabbed food at the airport, and when 10pm rolled around, social media was abuzz when the Mississippi Blues race director announced the cancellation of his race due to the ice. So, I'd be SOL anyway, even if I had made it to Jackson. During this time, my social media plea worked and I managed to secure a room at a friend-of-a-friends townhome in the Kirkwood neighborhood of Atlanta, taking an Uber there around 10:30pm. So many thanks to Colleen, a friend of my friend Melissa's from college, who kindly provided me a guest room at her place. But what about my second race? Well, thankfully, Mobile, Alabama, where the Sunday race was located, was largely spared by the ice storm. 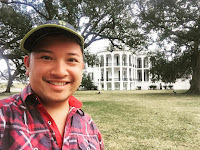 Earlier in the week, when the forecasts were looking dire, I got in touch with my friend Cozette, who did live in the Atlanta area and was planning to drive down to Mobile on Saturday morning. Riding with her would be my "plan B" to get down to the second race, if I was stuck in Atlanta. I had planned to ride back to Atlanta with her after the race anyway, as my flight back to NYC would be out of there Sunday evening. So I arranged for her to pick me up from Colleen's on Saturday. The next morning around 11:30am, Cozette gingerly made her way from her sister's place in Lawrenceville into Atlanta to pick me up. We very carefully drove out of the disturbingly desolate streets and highways of Atlanta, making sure not to hit any wet-looking patches on the road. There was only one truly scary moment, as we took the offramp from I-20 to I-85, we skidded a little and saw four cars damaged and abandoned on the side of the road. As we left the Atlanta metropolitan area, the roads were absolutely barren. 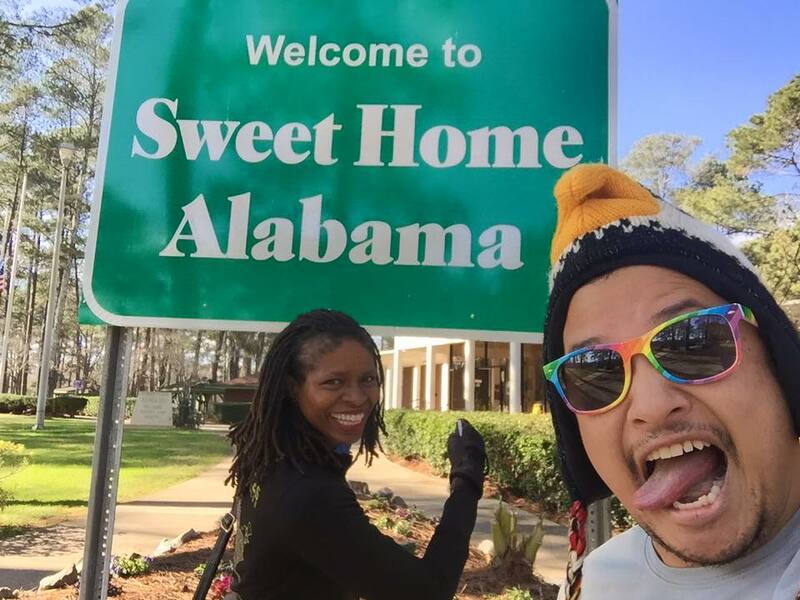 Finally got to be devoid of icy patches by the time we made it past Newnan, about 30 miles outside of Atlanta.. We stopped right after the Alabama/Georgia state line for a bathroom-slash-finally-catch-our-breath-and-unclench-our-assholes-now-that-the-roads-are-better-break, and then again in Montgomery for lunch, arriving in Mobile around 3:30 in the afternoon. The drive after getting into Georgia was quite fun, as we sang along to music on the radio, as I posted Facebook videos of our shenanigans along the way. We headed to packet pickup at the Mobile Government Plaza Atrium, then headed to our respective hotels, before freshening up and heading out to dinner at Felix's Fish Camp Restaurant in Spanish Fort, AL, with new and old running friends from all over the country who had come in to do the race, many having been in Jackson and driven in on very icy roads, some with standstill traffic along the highway earlier that afternoon. Among them was Seth, who would be rooming with me in Mobile. Early the following morning, we woke up at 6:30, and were out the door at 7 to drop off my bags at Cozette's hotel (logistically, this worked out the best, as I would get a shower in at her hotel where check out was at 2, before we'd drive back to Atlanta) and then head to the race start, where it was a pretty cold 27° with an 8 MPH wind, so it felt more like 18. I had arranged with the race director to do the national anthem at the start, marking off Alabama as an anthem state (yay! ), and then we were off! Having done this race exactly two years prior, I remembered it being a nice flat course for the half, and a really pretty course with the majestic oak trees lining the street. When I ran the half, I was on my second day of a double half marathon weekend, and feeling pretty sore - this time, though, I didn't have that issue, though I was coming back from a cough/upper respiratory ailment from a cold that I had the week prior. 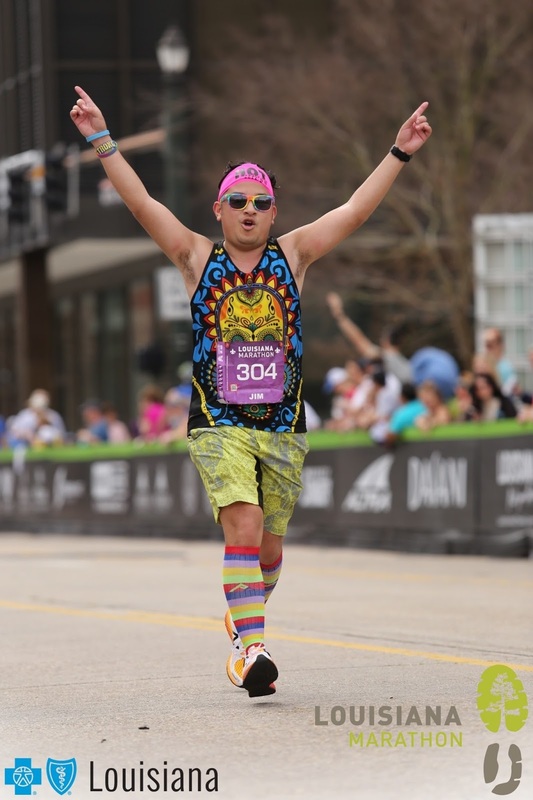 I decided to take it pretty easy, not pushing it faster than 10 minute miles, and followed a strict 9:1 cadence, and later a 4:1 cadence that would eventually just be whenever I felt like it, which seemed to be successful when I ran my two near-PR setting marathons in December. 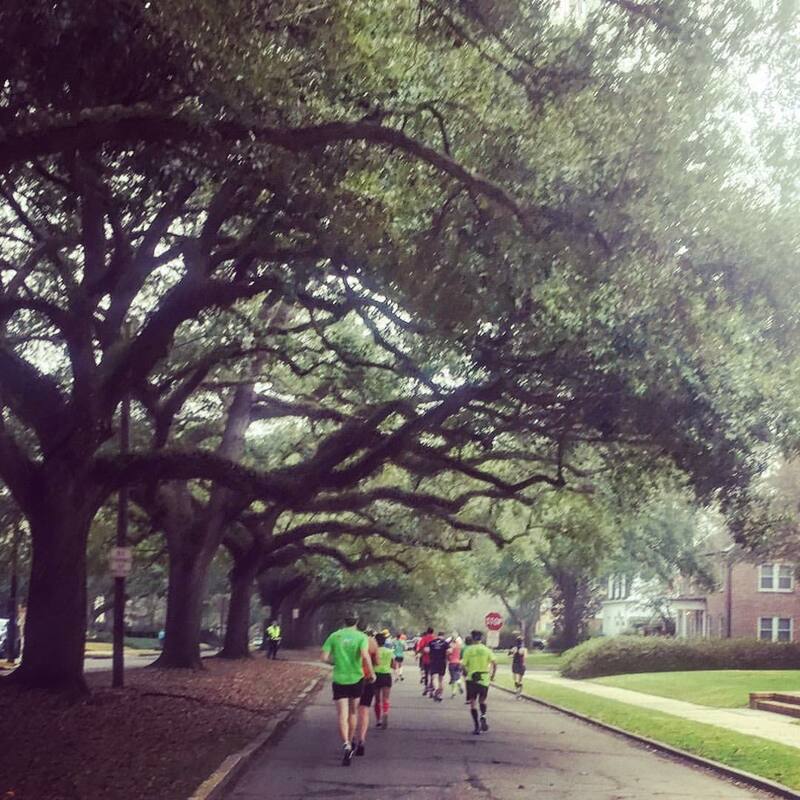 The course made its way down Government Street looping down South Broad Street into the Washington Square neighborhood, where we would make our way around the historic Magnolia Cemetery. 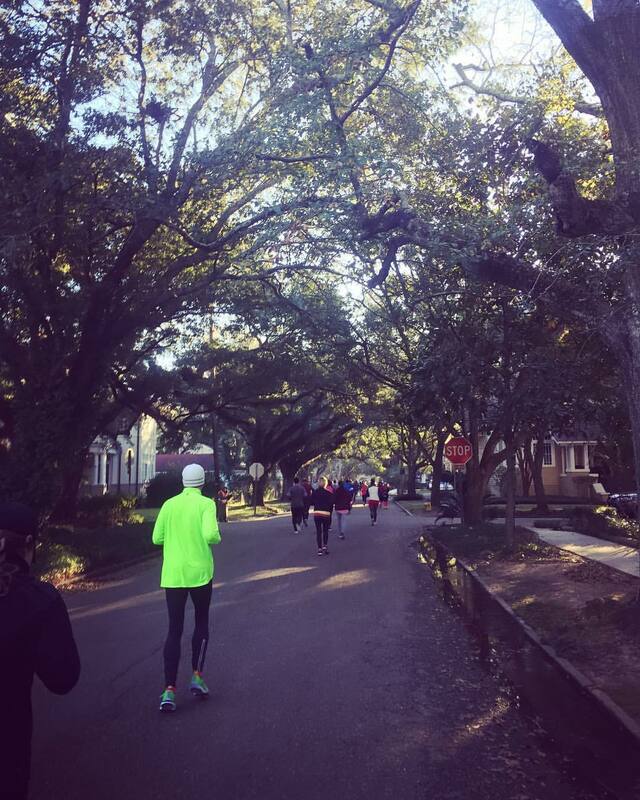 Through our residential surroundings, we rounded Virginia Street and up Ann Street, turned right onto Selma Street, and zigzagged until we got back onto Government, where we would run a nice length to the 10k mark. All the while, we'd go over some small speed bumps in the road (to reduce driver speeds in this family-centered area), complete with signage warning of the slight road hazard. 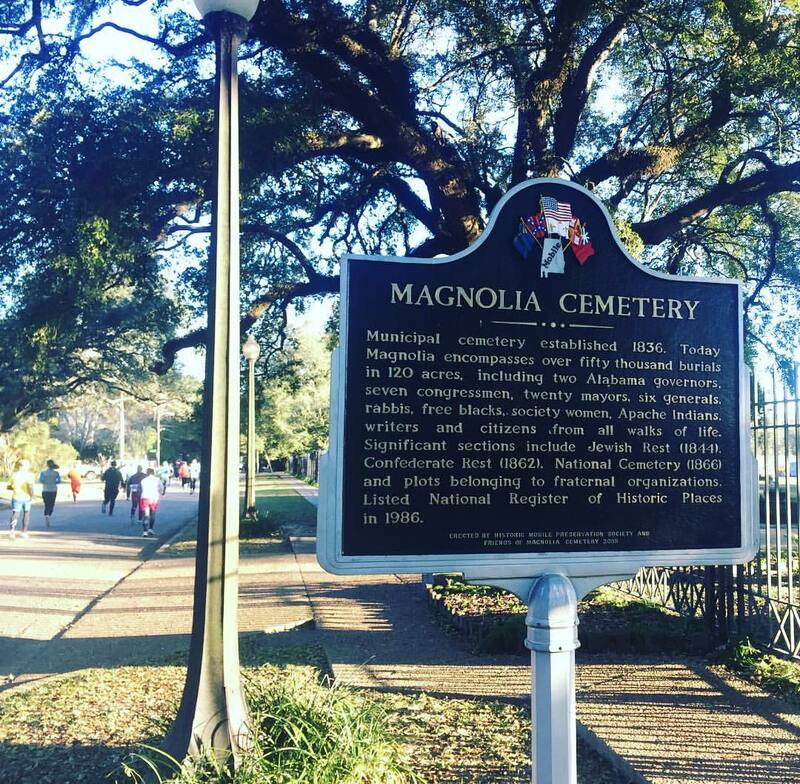 We continued on, taking a slight right onto Old Government Street, and then onto Fulton Street up to Dauphin Street. We turned left onto Dauphin, a street we'd return to much later in the race, and then headed up Mobile Street alongside UMS-Wright Preparatory School, an independent co-ed prep school, before the split off from the half marathoners at the 8.5 mile aid station, aka the "red dress station" (where all the volunteers, men and women, wore red dresses!) Everything seemed quite similar, and nice and flat like I had remembered it from two years ago. We turned left, and took Old Shell Road to a rather nondescript part of town, before making a left onto Gage Avenue (however, we could see the cones set up further down Old Shell - eventually, we would be making our way back along this street in the opposite direction headed back to the finish in a few hours.) 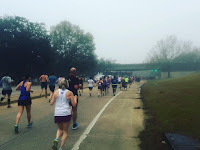 We would return to different part of Dauphin Street, passing the Dauphin Square Shopping Center, before encountering something never seen at all in the half marathon course - our first big hill, crossing over the I-65 overpass. However, that was minute compared to what was coming up. As we crept further west on Dauphin, past the Spring Hill Golf Course, the hill got steeper, reaching a crest of 173 feet. Despite this uphill, we were treated to a beautiful canopy of oak trees as far as we could see on both sides of the divided street. At the top of the hill, we turned onto the aptly named Hillwood Road. We'd ascend even further as we made our way around Country Club Road and eventually Bit and Spur Road, reaching the highest elevation point of 238 feet, just past the halfway point of the marathon course. We were treated to a nice 100 foot downhill for the next 3/4 mile, as we headed northward on S. University Boulevard, which promptly retreated back upward as we made our way into the campus of the University of South Alabama (USA). 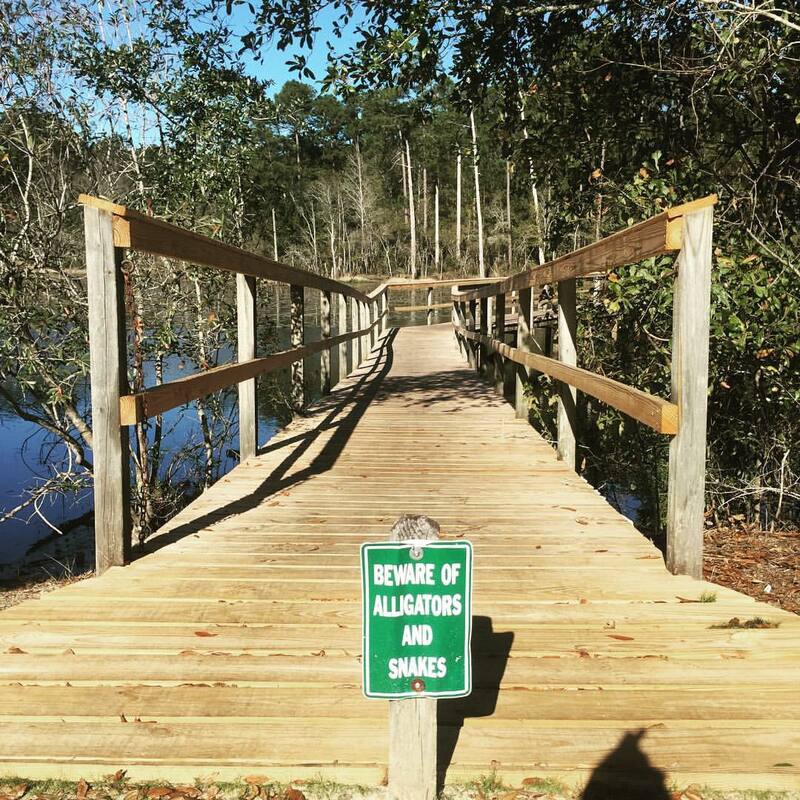 Unexpectedly, we encountered a slight detour as we continued along USA South Drive. 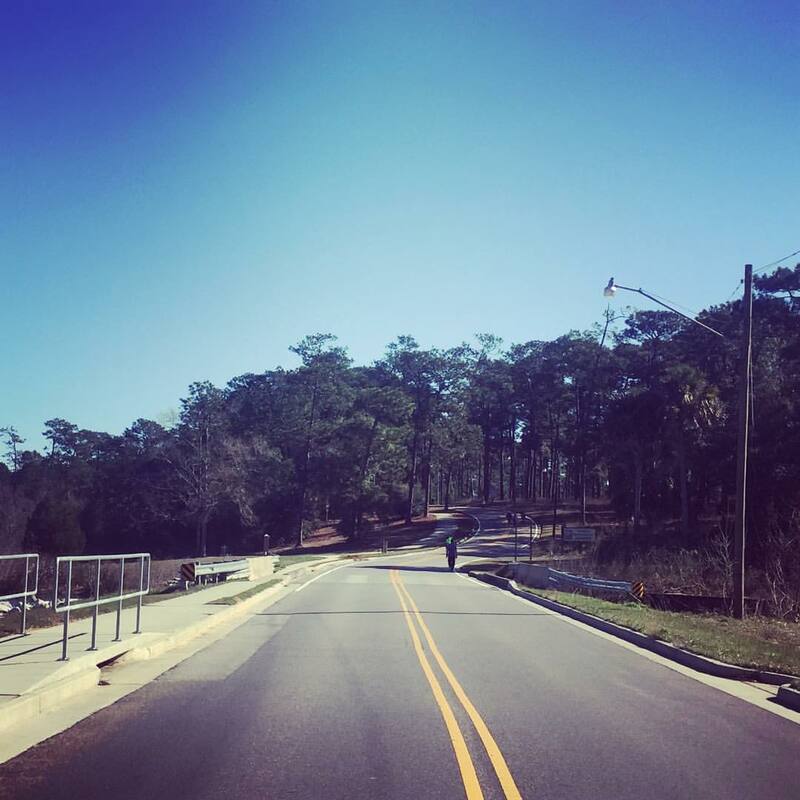 At mile 15, we were detoured into a parking lot due to construction on the road, but soon enough we were back on course, heading north along Aubrey Green Drive, and passing some heavily wooded areas just north of campus and west of USA's Technology and Research Park. 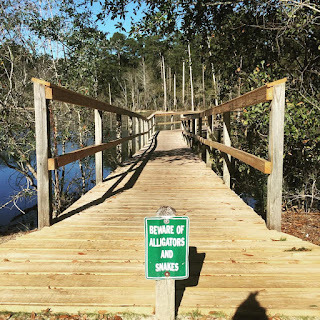 Like in South Carolina, there was an abundance of "Beware of alligators and snakes" signs as we went through this marshy area. We soldiered on, heading to the main road, at University Drive, heading north. At that point of the race we were 16.5 miles in, and my ankles were beginning to hurt... the bit of a break I took, as well as running in brand new shoes was likely taking its toll. 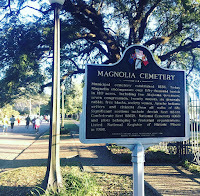 We were finally heading back in an easterly direction toward the downtown area, making our way through the Parkhill neighborhood, and passing Langan Park and the Mobile Museum of Art along Museum Drive. Here, we encountered the steepest hill of the course as we made our way out to the residential neighborhood of College Park. 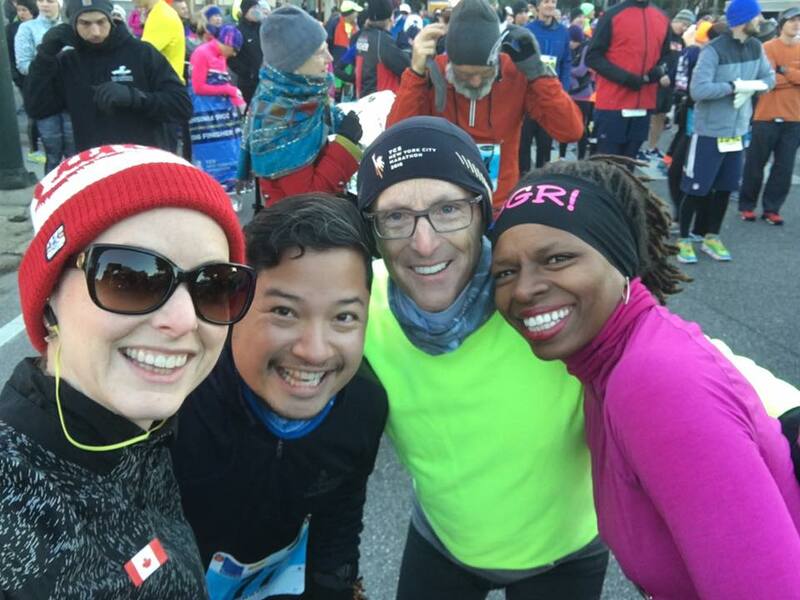 At mile 18, we were treated to delicious cups of chicken broth, which were absolutely welcome while running through this chilly morning. 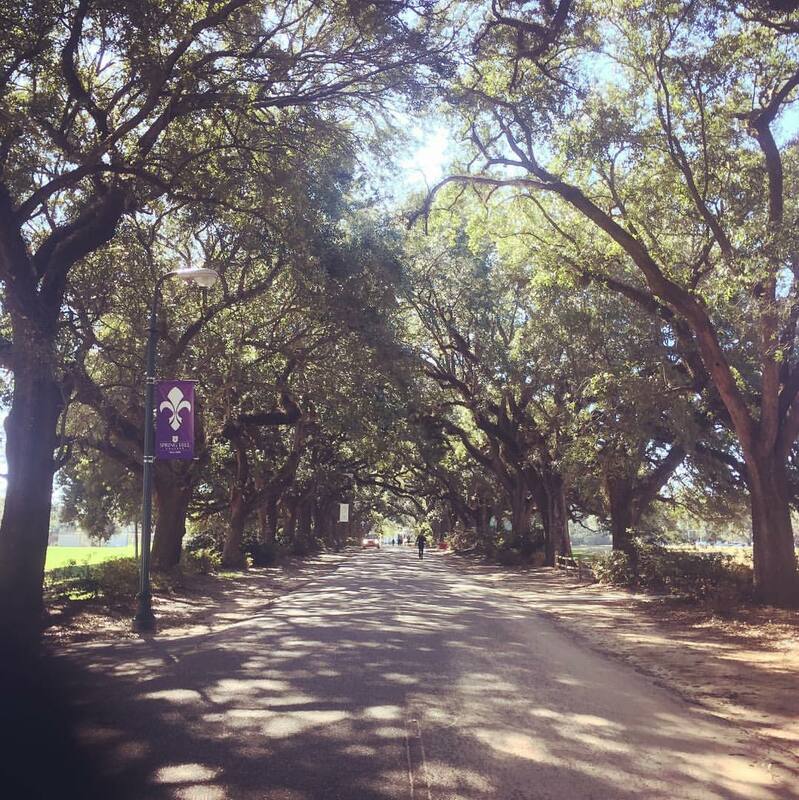 After a short jaunt through, we make our way through part of Spring Hill College, including a really pretty tunnel of oak trees, and then back out into the residential areas surrounding the college. 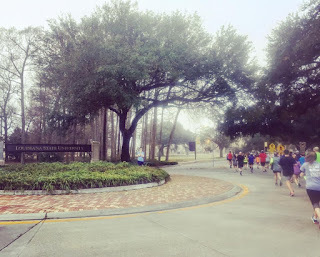 We then retraced our steps from Old Shell Road back toward where the half marathoners split off. At around the mile 20 mark, I finally saw Melinda, and she would stay within view for the remainder of the race. As my ankles were crying out in pain, I was also able to get an Advil from an "unofficial" aid station in front of someone's house (thank you! ), but wasn't able to ingest it until we reached the mile 22 mark where there was a water station. We reached the Red Dress Station again, but this time, we turned back down toward Dauphin Street, and followed that for the last 3 1/2 miles back to the finish line to downtown in Bienville Square. 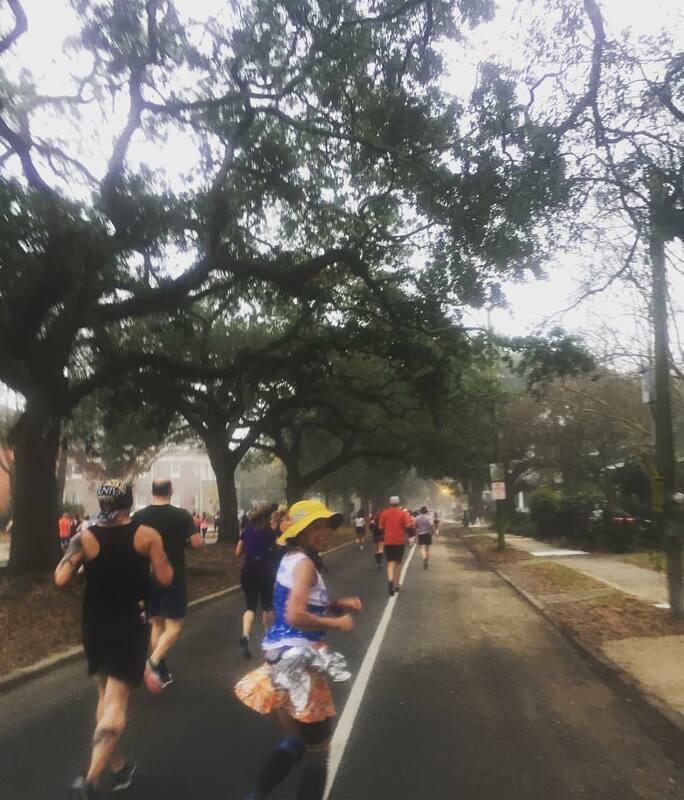 My pace had slowed to 12 and 13 minute miles by the end, and so I struggled as I came down Dauphin Street, mostly alone. I finished in 5:21:14, much slower than in Kiawah Island, but considering the dramatic travel weekend I had to go through, and the cold weather, I was content. 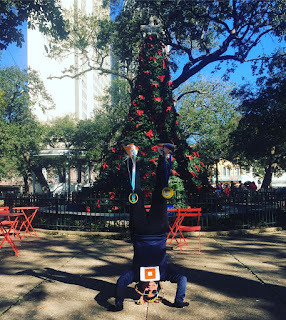 I retrieved my race medals, thanked the race directors for giving me the chance to sing the anthem at the start, quickly scarfed down red beans, rice, and sausage (I remember how delicious this was two years ago! 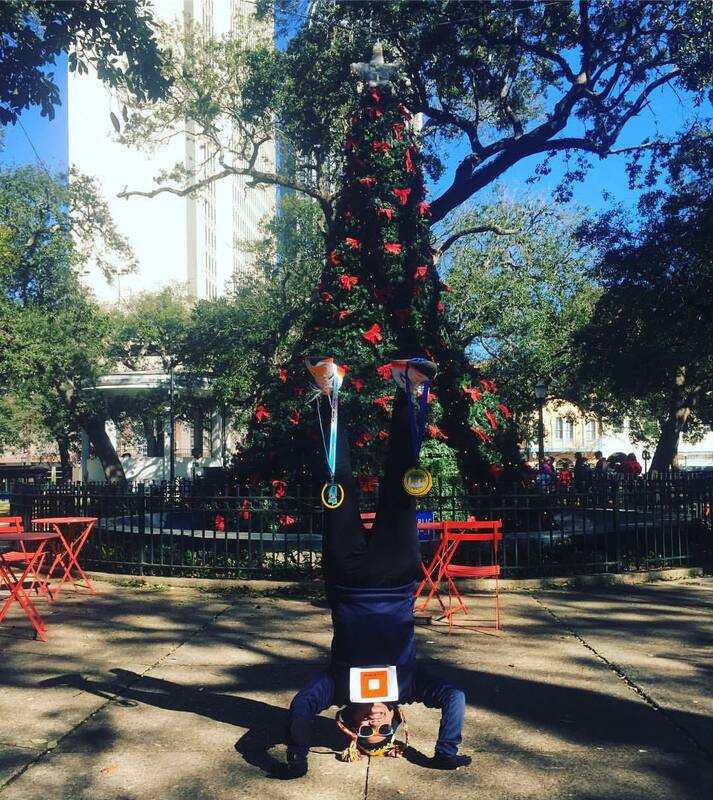 ), and then got my headstand photo in front of the Christmas tree. I shuffled off to Cozette's hotel, where it took awhile before I got to go upstairs to manage me being able to get a key. I quickly showered, and then we were out the door at 1:50pm, and on the road back to Atlanta. We made it back to Atlanta and tot he airport with more than enough time to spare, despite the hour lost changing from Central to Eastern time. Luckily, my flight was delayed half an hour, too, due to late arriving crew. Exhausted, I slept for practically the entire flight. I arrived later that evening at LaGuardia to a snowy New York City, and was in bed by midnight, ready to start Monday up again anew. And my first marathon of the year was checked off!